The Second Epistle to the Thessalonians, also known as the Second Letter to the Thessalonians. It is traditionally attributed to Paul, because it begins, "Paul, and Silvanus, and Timothy, unto the church of the Thessalonians in God our Father and the Lord Jesus Christ;" (2 Thess. 1:1) and ends, "The salutation of Paul with mine own hand, which is the token in every epistle: so I write" (2 Thess. 3:17). 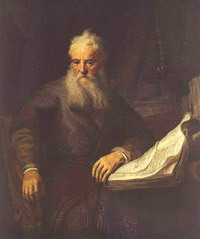 Those who believe Paul was the author of 2 Thessalonians also note how Paul drew attention to the authenticity of the letter by signing it himself: "I, Paul, write this greeting with my own hand, which is how I write in every letter.". Bruce Metzger writes, "Paul calls attention to his signature, which was added by his own hand as a token of genuineness to every letter of his (3:17)." Other scholars who hold to authenticity include Beale, Green, Jones, Morris, and Witherington . The traditional view is that the second epistle to the Thessalonians was probably written from Corinth not many months after the first. Apparently the first letter was misunderstood, especially regarding the second advent of Christ. The Thessalonians had embraced the idea that Paul had taught that "the day of Christ was at hand", that Christ's coming was about to occur. This error is corrected (2:1-12), and the apostle announces what first must take place before the end times. A passage from this book reading "For even when we were with you, this we commanded you, that if any would not work, neither should he eat", (2 Thess. 3:10), was later adapted by Vladimir Lenin as an adage of the Soviet Union, He who does not work, neither shall he eat.